The transportation of hazardous chemicals has been identified as the most serious threat to the residents and guests of St. Clair County. Based on a 1997 transportation study conducted by the Office of Emergency Management, results show over 37 million pounds a day of these hazardous chemicals traveling across our road and railways. The St. Clair County Board of Commissioner's and every community within the county have partnered to fund a hazardous materials response team, which became operational in 1999. The structure of the team is completely volunteer, with approximately 40 members from all different fields of expertise. Each team member has received over 80 hours of advanced hazardous materials training which additional monthly team training supports. In addition, members attend special training both within the state and out of state to enhance their response abilities. The team is administered by the Office of Emergency Management and has a Command Staff in place for team operations. The Command Staff insures that one officer is available at all times to respond and assist the Incident Commander with technical information in the event a full team response is not needed. The team has also been designated by the State of Michigan as a Regional Response Team for Weapons of Mass Destruction incidents within the state. 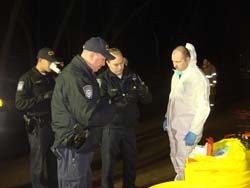 The team has sophisticated detection and response equipment for chemical and biological incidents and recently was the first regional response team in the state to be sent to a potential WMD incident. With the support of the county and our communities, this exceptional response team will continue to grow and maintain the training and equipment to protect the residents and guests of St. Clair County. Click here to log into the members only site. If you have any questions about the Hazardous Operations Team, contact Wayne Brusate at the Office of Emergency Management: (810) 989-6965 or wbrusate@stclaircounty.org.